Through a scanning electron microscope the butterfly’s superbly engineered body is magnified hundreds of times to reveal compound eyes made of thousands of individual lenses, wings covered with microscopic solar panels, and navigational systems that unerringly guide Monarch butterflies on their annual migration from Canada to Mexico. How did these extraordinary creatures come into being? Are they the products of a blind, undirected process? Or were they designed for a purpose by an intelligence that transcends the material world? Filmed in the rainforests of Ecuador, Mexico’s Transvolcanic Mountains, and leading research centers, Metamorphosis is an unforgettable documentary filled with the joys of discovery and wonder. The production of Metamorphosis began in January 2010 when the producers decided to create a film that would reveal the evidence for intelligent design based upon the life cycle of a butterfly. This cycle has long defied explanation by any materialistic process. The documentary also explored the anatomy of butterflies and the migration of the eastern population of North American Monarchs. Principle photography took place at the McGuire Center for Lepidoptera (University of Florida), Butterfly World (Ft. Lauderdale, Florida), Tinalandia, Ecuador, and Central Mexico. The film features the first study of the metamorphosis process via magnetic resonance imaging. Biologist Richard Stringer photographed a complete cycle of a Monarch butterfly’s metamorphosis at Duke University’s Center for In Vivo Microscopy. The MRI scans then became the basis of a three-dimensional computer animated depiction of the transformation from caterpillar to adult flying insect. Metamorphosis is also highlighted by an original score composed by Mark Edward Lewis. The score features an African choir that adds a unique and powerful emotional tenor to the film. 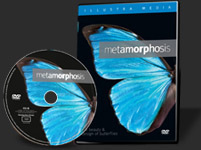 In addition to the DVD version, Metamorphosis was also released in the Blu-ray format. Both versions include more than an hour of bonus features.